1.Parts for opening the four organic glass doors are mounted at the top place so that the entire pressing chamber of the ZP31E rotary tablet press looks clean and bright. 2. The pressing chamber is designed with an integrated stainless steel baseboard to prevent powder from leaking into the cabinet. 3. Parameters of material filling and pressure adjusting are displayed digitally so that it is difficult for users to make operation mistakes. 4. The interchangeable upper guide rail only needs to change a circle of rail after long term abrasion without dismantling the top cover and replacing the pedestal, saving time, labor and cost effectively. 5. Our rotary tablet press applies Mitsubishi frequency converter for continuously variable speed regulation and it is powered by 4kw ABB motor. 1. The worm drive box is integrated with integral worm and another set of bearings mounted at the worm gear that is installed at the lower part of man shaft. In this way, the thorough efficiency of worm drive increases. 2. Our ZP31E-1 rotary tablet press uses the pressure shaft and bearings in larger size to bear larger pressure. 3. It adopts the 5.5kw motor instead of 4kw one with matching frequency converter. 4. Both the middle plate and upper plate of the machine are enlarged by 1cm for bearing more stress and improving its stability. 5. With larger pressure, the reinforced type machine can bear 10 ton pressure and the ordinary part can only undertake 8 tons. This ZP31E-1 machine will be more compliant with new version GMP standard. If needed, it can be equipped with pressure sensor for adjusting pressure, PLC programming unit and touch screen for data setting and displaying, USB port for data collection in pressing process, etc. 1. This double-press rotary tablet press uses nonstandard dies to make double-side ejected tablets. It gets the granular materials pressed into round tablets in large diameters and other shapes of pills in different specifications. 2. With precompression roll and main compression roll, this machine makes the tablet with optimized quality. 3. Adjustment unit operated by hand wheel performs accurately and flexibly with digital display of data. It simplifies the procedures of filling materials and adjusting the thickness of tablets. 4. This rotary tablet press is easy for operation with high safety and reliability. When the overload appears, it will stop automatically because of its overload protection unit. 5. We have taken a series of actions to prevent the tablets from pollution. For example, the stainless steel housing is totally sealed, all parts in contact with medicine are made of stainless steel or specially treated on surface to be nontoxic and corrosion resistant, and the turret surface is specially processed. 6. This transparent pressing chamber can be totally opened for easy cleaning and maintenance. Moreover, it is configured with safety lighting fixture inside. 7. 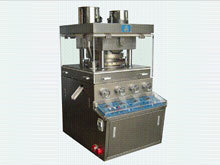 The machine can also make double-colored tablet if customized. The maximum production capacity of ZP31E rotary tablet press is 89,280pcs/h. It uses nonstandard dies to make double-side ejected tablets. The maximum thickness of tablet is 6mm, and maximum diameter of tablet is 22mm (specially shaped 25mm). FEIYUN, as an experienced pharmaceutical machinery manufacturer, also offers medical high purity nitrogen generator, capsule polisher, capsule filling machine, medicine pack blister packaging machine, etc. All of our pharmaceutical equipment is manufactured in compliance with cGMP standards. For high quality pharmaceutical machines with specific functions, please contact us and we will give you a recommendation about the machines.